If all you knew about the internet was what you saw in movies, you would think the world would be better off if it rolled back the digital revolution, returning to analog card catalogs and mimeograph machines. Probably the last time something good happened on-screen because of a computer was when Matthew Broderick raised Ally Sheedy’s grades in WarGames—but subsequent events got rather complicated for them. 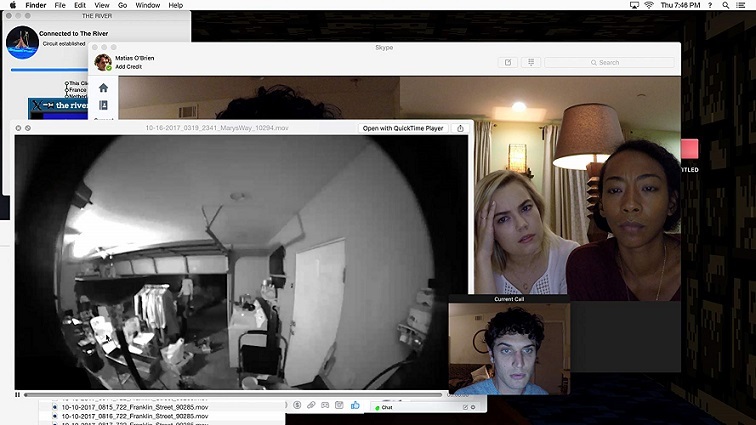 In this case, things go from bad to worse for a group of friends skyping together in Stephen Susco’s Blumhouse-produced Unfriended: Dark Web (trailer here), which opens today in theaters. After weeks of eyeing a sleek new laptop in his coffee shop’s lost-and-found, Matias, a poor aspiring game-designer finally succumbed to temptation. Obviously, that last sentence has multiple believability issues, but let’s continue anyway. When it starts acting buggy during a skype session friends, the nebbish gamer discovers a cache of hidden violent surveillance videos and an interface for dark web communication modeled after the mythological Styx River. Matias quickly deduces the previous owner was an agent of “The Circle,” who abducts and murders victims for their viewing pleasure. More ominously, he knows that Matias knows, which puts him and his friends in jeopardy. Soon, he is sending Matias ultimatums, demanding the return of his laptops, or else he and his deaf girlfriend Amaya (not on the group chat), along with the rest of his friends, will suffer the consequences. Frankly, Unfriended: Dark Web (a loose thematic sequel to the 2014 movie, just plain Unfriended) suffers badly in comparison to Aneesh Chaganty’s forthcoming Searching (known as just plain Search at this year’s Sundance). It too uses the movie-via-digital-screens-and-face-time concept, but its narrative is much more inventive. Chaganty’s protagonist figures out ways to use the technology that very likely contributed to his daughter’s disappearance in his desperate attempt to find her. In contrast, Susco’s Dark Web follows an undeviating line straight to Hell. Do not pass go, do not collect $200, do not give us any hope or build up any real suspense. Even though Blumhouse regular Betty Gabriel is on-board as Nari, the cop fiancé of Matias’s pal Kelly, the cast of skypers are problematically bland and forgettable. Only Stephanie Nogueras registers to any extent as the sensitive Amaya, who has understandably had enough of Matias’s immaturity. Nor is there a really distinctive villain to focus our attention on. The Circle is certainly disturbing as an idea, but whenever the conspirators appear on-screen, they use digital signal distorters, so basically this film reduces down to empty-headed hipsters getting murdered by static. On the plus side (for Blumhouse), this had to be incredibly cheap to produce. Unfriended: Dark Web is the sort horror film that leaves you feeling angry and used, because it took ninety minutes of time to take viewers someplace so grim and unsatisfying. Take heart, Searching is a good film (that keeps looking better and better), which will redeem this general conceit when it screens at Fantasia and AAIFF before opening theatrically on August 3rd. In the meantime, we have Unfriended: Dark Web to contend with, but you are better off skipping it when it opens today (6/20) in multiple New York theaters, including the AMC Empire.